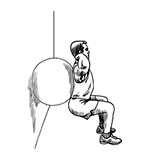 Crouch with your back pressed against the exercise ball, itself against the wall, knees at 90 degree angles and place your hands behind your ears. Raise yourself up by extending your legs and slowly lower yourself back after a short pause. Breathe out while raising yourself up and breathe in while returning to starting position. 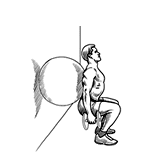 Crouch with your back pressed against the exercise ball, itself against the wall, knees at 90 degree angles and hold dumbbells with your hands down your body. 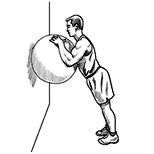 Crouch on one leg with your side pressed against the exercise ball, itself against the wall with your knee at a 90 degree angle. Raise yourself up by extending your leg and slowly lower yourself back after a short pause. Alternate sides after each set. 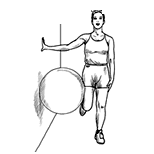 Stand with one ankle on top of the exercise ball behind you and crouch down until your knee is at a 90 degree angle. Stand with the wall on your right side and hold the exercise ball up from the floor against the wall with your right thigh, knee bent. Squeeze the ball by pressing your leg against it and slowly bring it back after a short pause. Alternate sides after each set. 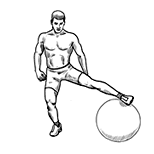 Stand on your right leg and put your left foot on top of the exerciseball, leg extended to your side. Roll the exercise ball towards you by bringing your leg in and slowly roll it back after a short pause. Alternate sides after each set. Breathe out while rolling in and breathe in while returning to starting position. 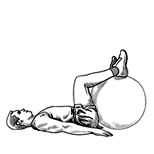 Lie on your back and grasp the exercise ball using your calves and your thighs. Squeeze the exercise ball by pulling your feet towards your buttocks and slowly unsqueeze after a short pause. 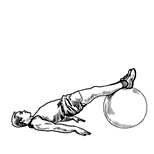 Lie on your back, feet on top of the exercise ball, legs and back straight. Roll the exercise ball towards you by bending your knees and allow it to slowly return back after a short pause. 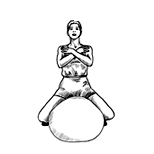 Sit on the exercise ball with your thighs on each side of it and place your hands across your chest. Squeeze the exercise ball between your legs by bringing your thighs closer to each other and slowly unsqueeze after a short pause. 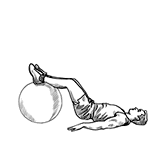 Lie on your back and grasp the exercise ball between your legs below your knees. Squeeze the exercise ball between your legs by bringing your thighs closer to each other while lifting your buttocks from the floor and slowly unsqueeze after a short pause. 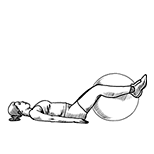 Lie on your back with your feet on top of the exercise ball, knees and thighs bent. Lift your back from the floor by extending your legs and slowly lower yourself back down after a short pause. 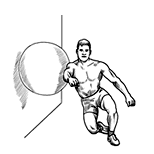 Stand up and lean against the exercise ball itself pressed against the wall in front of your chest. Raise yourself by standing on your toes and slowly lower yourself back down after a short pause. Make sure that only the calf muscles are exercising. 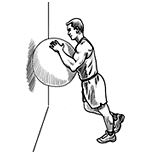 Stand up on one foot and lean against the exercise ball itself pressed against the wall in front of your chest. Raise yourself by standing on your toes and slowly lower yourself back down after a short pause. Alternate legs after each set. Sit on the floor, hold the exercise ball on top of your ankles and place your hands on it, arms and legs fully extended. Squeeze the exercise ball by pulling your toes towards you and keeping your arms fully extended and allow it to unsqueeze after a short pause. Call Timing : 9 AM to 7 PM Only.